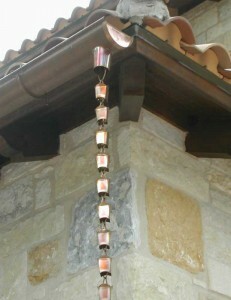 Have you seen rain chains on homes around Los Angeles and fallen in love with them? Have you wondered what you need to do to obtain them and have them installed for you? Well, we can help. We are experts in rain chain installation and repair, with all types, and we excel at sourcing for quality and affordable rain chains that meet your needs. Rain chains come in various designs and sizes, and they have various effects when channeling water away from the rain water downspout you are using for roof gutters. Many home owners that know about rain chains value them, and whoever has seen one in action will love to have it immediately installed. Rain chains are beautiful to have around the house, and their value and beauty is unparalleled during slight or heavy rainfall. We are your best bet when it comes to purchasing or installing rain chains. We have been in the rain chains business for over 15 years, and our expertise with all kinds of rain chains serves our new and existing customers so well during rainfall. Rain chains are terrific when you see them serving you during rainfalls, and the artistic beauty they present coupled with the gurgling sounds they make give you a pride of ownership. We can help you install any kinds of desired rain chain or related products for low prices, and you can trust us to help you shop for the best ones that will serve your needs and fanciful purposes. We have served the needs of many residential and commercial customers in this way, and you can trust us to meet your needs as well if you’d only commission to start immediately. There are many kinds of rain chains and they come in various materials and designs. There are copper rain chains, iron rain chains, aluminum rain chains, and brass rain chains among others. Some of these are designed in square-cup shapes, double copper loops, iron flower cup, art and craft, and flared-cup shapes. This means you can shop by designs to purchase cup chains, link chains, premium chains, and themed chains among others, and you can equally obtain custom fabrications and designs. We can also help you to obtain your own designs and shapes and help install them to make them serve you for decades to come. Rain chains are best used as home and garden decors, and when installed along rain gutters and downspouts, you obtain the best rain sights ever possible anywhere. We can also help out with rain chain repairs, and you only need to inform us of your needs to get us started on your goals. Have a new rain chain installed to your home by our experts, today. We can easily provide you with rain chains designs and installations that are targeted at meeting family needs and preferences, and we can install them along your rain water downspout or anywhere in your garden. They also make a good sight when installed by your patio or front yard, and you can enjoy the best of rainfall sights if your rain chain’s designs and installations meet your needs. Contact us today for help, and we will assist you within 24 hours. Our gutter experts offer top quality, affordable, & fast seamless gutter installation for Los Angeles & surrounding area residential & commercial properties. We use eco-friendly materials & consider all possible environmental issues in our gutter designs. We offer cost-effective, 24/7 emergency rain gutter cleaning services to Los Angeles County, Orange County, & Ventura County residents & businesses. Help protect & preserve the value & integrity of your property & rain gutters, contact our gutter cleaning professionals today. Gutter screens & gutter guards not only help protect your home by reinforcing the sturdiness of your rain gutters, they will also keep your rain water so clean you can store it for future use! An important feature to consider during California's drought & water conservation efforts.